Is this dinghy too small?? Im looking for a small dinghy for my Camano 31 and my Torqueedo 1003. The smallest one I found is the Highfield RU 200sl. Its only 6'7 long and has a beam of 3'10! Not aware of your needs....I would get the largest size that fits where you will carry/store it. I've never wanted a smaller dinghy, but many times a larger. Sea life, I'll be carrying it on the swim grid. Probably on its side. I want it smaller so I can still utilize some of the swim grid. I had the weaver davit system on my 1982 34' mainship. I picked the dinghy length based on boat beam for docking purposes (also didn't want any waves coming off side and hitting while underway in rougher water, so 1-2' shorter than beam). I found the platform worthless when dingy was up, also a pain to chris cross stern lines tying up. I don't think a smaller dinghy would have made the platform useable or swim ladder accessible. I agree with the idea that too small a dinghy is more difficult to deal with than too large a dinghy. Size matters! Look at some of the dinghy davit systems that allow a larger dinghy easily stowed on the edge of the platform. We saw them everywhere in the Pacific Northwest. Here is what I'd be looking at. 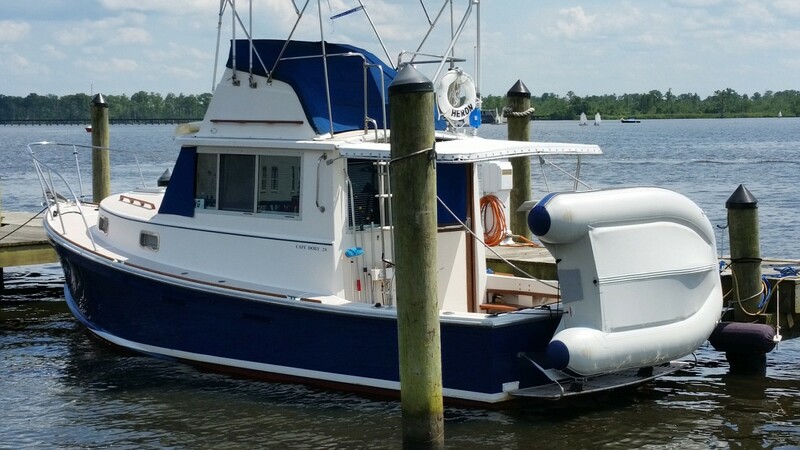 I just downloaded this from a Camano listed on Yachtworld. My boat is about the same size as yours and I carry an 8' Avon on it's side on the swim platform. If I want to use the platform I just launch the dinghy. I don't use Weaver Davits. I just stand the dinghy on it's side and tie it to the stern cleats. The Highfield is rated for two people but I think that assumes the passenger sits in your lap. There's a fine line between a small dinghy and a pool toy and in my opinion, this crosses that line. The thing that concerns me is the beam. You might take that dinghy to shore in calm water but it might not be that calm when you're ready to return. How many people will be on it at one time? With a boat that small weight and the shifting of weight becomes a handling problem. It's even a problem with my dinghy, which if I remember correctly is just under 8' long with about a 5' beam. It was upset one time when my wife got off the boat onto the same side I was sitting on. Unless you will be using it by yourself, I think you should get something wider and perhaps longer. Mine has two air chambers and a high pressure air floor. It serves the purpose but I carry it on the bow so as to not obstruct the swim platform. That is a SeaWise Davit system as near as I can tell from the picture. I have one and it works well. If you push up from 2M to 2.5M you should get something more usable and not too large. Beam should increase proportionately, the motor should cope. My 2.7M takes 3 adults happily(4 unhappily),but it`s a different brand, with quite large diameter tubes for size. Carrying a dinghy on the swim platform works fine when you are underway or anchored but it becomes a problem if you dock in a slip. First, it may increase the apparent length of the boat and you may damage it backing into the dock or a piling or power pole. It will interfere with visibility from the helm. Second, It can make tying the boat up difficult or impossible. Third, the swim platform cannot be used to board or exit the boat. You have to go over the side. Of course, the size and configuration of your boat makes a difference as does the size of the dinghy. 28' boat with 8'6" Quicksilver dinghy on weaver brackets. We find it really convenient and not intrusive at all. We drop it to a 45 degree angle for ventilation when docked. You may regret buying a dinghy as small as you describe. ...I would get the largest size that fits where you will carry/store it. I've never wanted a smaller dinghy, but many times a larger. Possum carries her dinghy just like Heron except I haven't installed Weaver Davits. I just sit my 8' Avon on it's side on the swim platform. A Camano 31 should easily carry an 8' dinghy. It's also very easy to launch the dinghy and let it drift back on it's painter if you want to use the platform. I wouldn't fuss about two vs three chambers. Don't think you're really OK with one gone in either case. But I think it's rare to have a sudden catastrophic tube failure. These are pretty tough durable boats. More likely a slow leak which you can deal with using a decent pump in an emergency. These small rollup boats are pretty easy to pack up and deploy, particularly with a good electric pump. Not sure it's done a lot in the trawler world, but you do have the option of keeping it in its bag some of the time as long as you have enough room to inflate/deflate on the foredeck. I've done this in sailboats where we had fewer options and it's not that onerous. Just one more possibility to consider. I have a RIB and really appreciate the performance, but if a small rollup works as your tender there are more options. ............... It's also very easy to launch the dinghy and let it drift back on it's painter if you want to use the platform. That doesn't work if you're in a slip, stern in. For moorage rates everything attached to a boat should be included in the measurement used to determine fees. It's not just "apparent" length. Exactly the same as bow pulpits. It is the length. Yes visibility aft may become bad but noise and exhaust fumes are even worse. I tried it only briefly and went to plan D. But for most (at least many) it's an excellent solution. Don't think I've ever needed the swim platform when I'm stern in. The OP's boat and mine are about the same length on deck. There are not a lot of options for carrying a dinghy. He wants to buy a tiny dinghy so he can carry it on the platform and still use the platform. I think that is a bad choice. I think he should buy an 8 ft. Dinghy and live with the inconvenience of having to move it to use the platform. He wants to buy a tiny dinghy so he can carry it on the platform and still use the platform. I think that is a bad choice. I think he should buy an 8 ft. Dinghy and live with the inconvenience of having to move it to use the platform. Trust WesK to find some awful perceived disadvantage. Lots of boats carry the dinghy on the platform. They even have ss railings to accommodate it without the need for Weaver fittings. Go for it, but I`m in the "upgrade to 8ft" or so group. 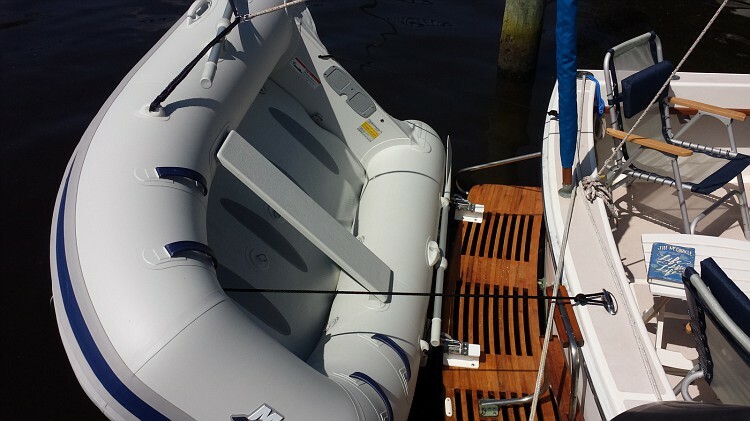 It won`t be much less inconvenient and the dinghy will be much more usable. I once had a 6ft or so f/g one, a nervous experience if it gets wavy.